Cassandra Johnson and Ramona Wright lived together as college roommates and lovers until Ramona grew nervous about her sexual orientation and deserted Cassandra for a life of loving men. Ramona’s daughter announces that she has met the man of her dreams and his mother is none other than Dr. Cassandra Johnson. Cassandra offers the use of her estate home to hold the wedding, but Ramona has another problem…she has Stage Two breast cancer and is seeking Cassandra’s help. Other issues arise as the wedding plans get pushed aside, including Ramona’s and Cassandra’s rethinking of their life choices. 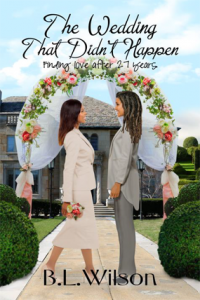 Will love win out in the end, or will lives be irrevocably ruined in The Wedding That Didn’t Happen? The Wedding That Didn’t Happen, is available for pre-order 2/23/16 on Kindle. The release date is 3/2/17.